Schools closed in Kuwait, Saudi Arabia and Bahrain following heavy sand storm. 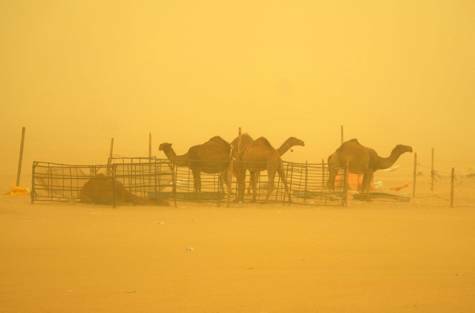 Kuwait has suspended classes and shut down schools after it was blanketed in heavy dust. The country's university, colleges and institutes were also closed for the day as a consequence of the bad weather, the education ministry said. In Saudi Arabia, the authorities said that schools in Riyadh and several provinces would be closed on Sunday following warning from the General Directorate of Civil Defence of heavy dust storm. In Dammam, Saudi Arabia, the coastguards have warned fishermen against venturing in the sea, urging them to wait until the conditions improved. In Bahrain, traffic authorities said that 54 accidents occurred between 6 am and noon after visibility was drastically reduced. Health officials said that 250 people had to be treated at the country's main hospital.